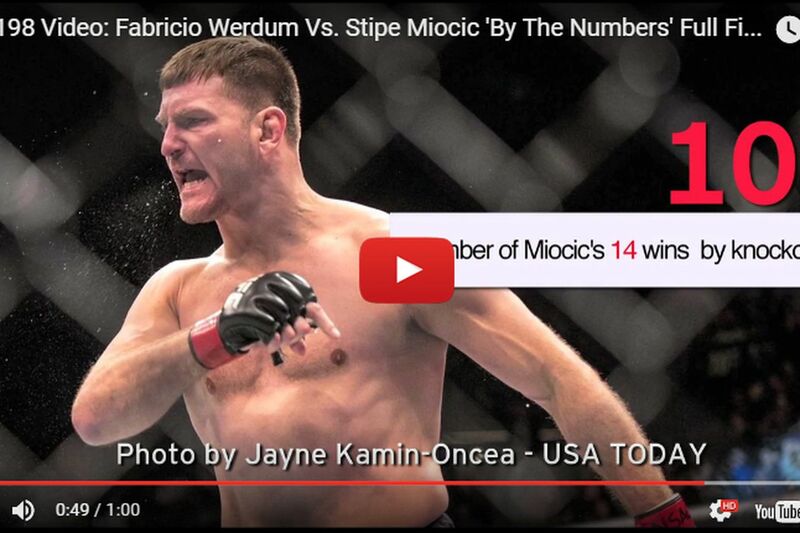 Does Fabricio Werdum have a reach advantage over Stipe Miocic? How many fights has the challenger won by knockout? Don’t waste your time with a Google search, as the boys in the truck put together all the relevant numbers for the upcoming UFC 198 pay-per-view (PPV) main event inside Arena da Baixada soccer stadium in Curitiba, Brazil, on May 14, 2016, where “Vai Cavalo” defends his heavyweight crown in the five-round headliner. But there are no guarantees it lasts that long, based on some of the stats on display in the embedded video above. Werdum by submission … or Miocic by TKO? MMAmania.com will deliver LIVE round-by-round, blow-by-blow coverage of the entire UFC 198 fight card on fight night (click here), starting with the Fight Pass “Prelims” matches online, which are scheduled to begin at 6 p.m. ET, and then the remaining undercard balance on FOX Sports 1 at 8 p.m. ET, before the PPV main card start time at 10 p.m. ET. For much more on UFC 198 including previews, predictions, videos, and more, check out our comprehensive “Werdum vs. Miocic” news archive by clicking here.